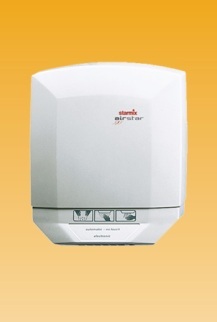 The modern maintenance-free hot-air hand dryers in attractive design. Powerful hygienic stream of hot air for fast but pleasant hand drying. Simple, service-friendly and most economical wall mounting without having to open the device. With integrated, detachable mounting plate and simple safety mains plug connection ready for operation. The special impact-resistant ABS case and the maintenance-free whisper-quiet motor guarantee a long and dependable service life.